Merino wool base layers are becoming increasingly popular among hikers, mountaineers and other outdoor enthusiasts due to the softness, great odor-control and superb temperature regulation of the fabric. For long it has been believed that all wool clothing is too warm for anything but winter use, itchy and offers inferior performance to synthetics, but this has been proven wrong. Merino wool fibers are very soft as they differ from ordinary wool by being less than 24 microns in diameter. The smaller the wool diameter is the softer and more comfortable the fabric will be – top-grade merino wool can measure as little as 17.5 microns in diameter. Merino wool base layers have different densities – from 135 g/m2 to 260 g/m2. Base layers made of Merino wool with the density of less than 150 g/m2 are best for use in warm weather while those with higher densities are best for use in cold weather. The main advantage of Merino wool base layers in comparison to synthetic base layers are better breathability, temperature regulation and odor-control. However, Merino wool also has a few disadvantages; base layers made of Merino wool usually dry slightly slower than synthetic ones (they absorb more moisture) and are more expensive. For in-depth information about base layer materials, check the Comparison of Base Layer Materials. 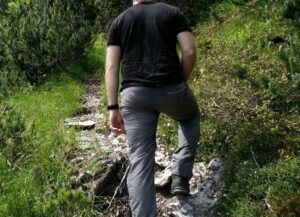 Approximately 2 months ago I started my “Hiking the Alps” tour and decided that it’s time to switch to a Merino wool base layer suitable for summer use. The main reason for switching from synthetics to Merino wool is the poor anti-odor performance of synthetic base layers – as even those treated with antimicrobial agents eventually have the odor-control substances washed out. Another reason is the slightly “plastic” feel of synthetic fabrics which I never really liked. 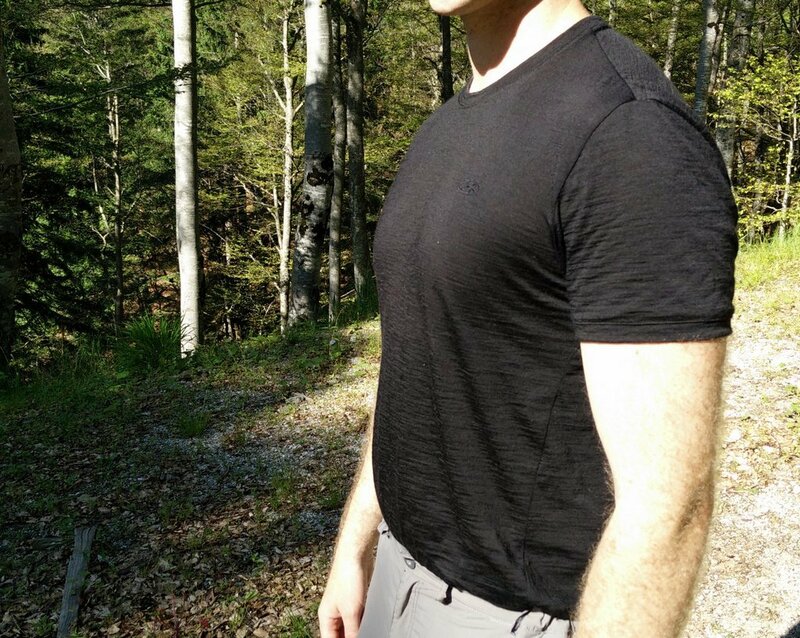 After thorough research I decided to buy the Icebreaker Tech T Lite t-shirt as it intrigued me by being very thin but at the same time also very durable; the fabric consists of a Nylon core wrapped in a merino wool construction (87 % Merino wool, 13% nylon) which significantly increases the durability. So far I wore the t-shirt on Jof di Miezegnot and Cima del Cacciatore hiking trips. Here is what I learned about the Icebreaker Tech T Lite Merino Wool t-shirt. The Icebreaker Tech T Lite is made of core spun yarns (87 % Merino wool, 13 % nylon) – which basically means that the Merino wool fibers are twisted around an inner core of nylon fibers. Nylon is included for enhanced durability as Merino wool has inferior durability/strength in comparison to synthetic materials such as polyester and nylon. 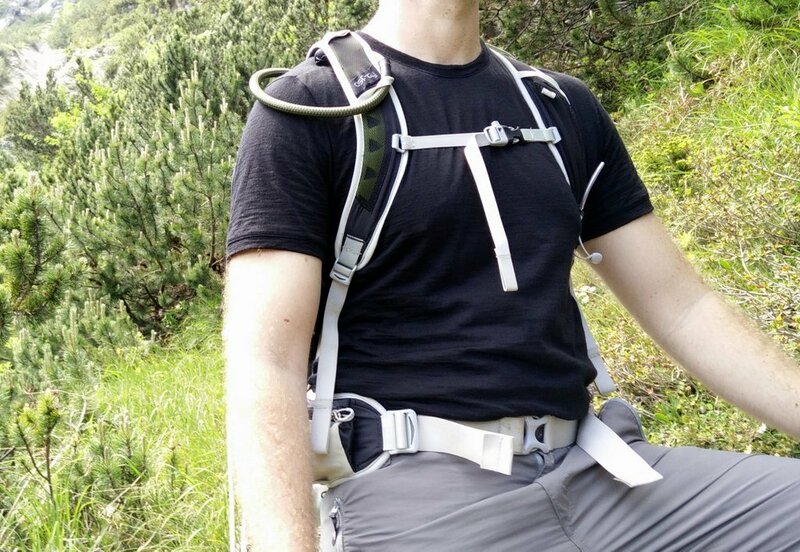 This is usually not a problem when the fabric is thick, but the Icebreaker Tech T Lite uses a very thin (150 g/m2) and porous fabric, so that it offers great performance in warm weather, and thus increased durability is definitely welcome. Due to the thin and porous fabric the t-shirt is also very light – it weighs merely 163 grams which is approximately the same as my synthetic base layers weigh. However, the Icebreaker Tech T Lite t-shirt offers much better breathability and moisture-wicking performance than the synthetic base layers – the moisture is instantly wicked through the thin and porous fabric and efficiently dispersed on the outside of the fabric so that it can evaporate. I didn’t use any scientific methods to assess the breathability, but a simple experiment with blowing the air into the fabric proved that synthetic base layers have much bigger “resistance” than the Icebreaker t-shirt. Even though Merino wool in general dries slower than synthetic base layers (it absorbs up to 33% of its own weight in moisture while polyester only absorbs up to 0.4 % of its own weight in moisture), I was very surprised how fast this the shirt went from being completely soaked with sweat to being completely dry (in relatively warm and windy weather). I think that the main reason for quick drying time is the porosity and thinness of the fabric as well as good moisture-wicking performance. I was particularly impressed with the excellent odor control. I wore the t-shirt on the Jof di Miezegnot hike where it got completely soaked with sweat – to the point where it had white rims of salt. I dried it overnight and when I put it on next day for the Cima del Cacciatore hike neither my girlfriend or I could detect any signs of unpleasant odor. 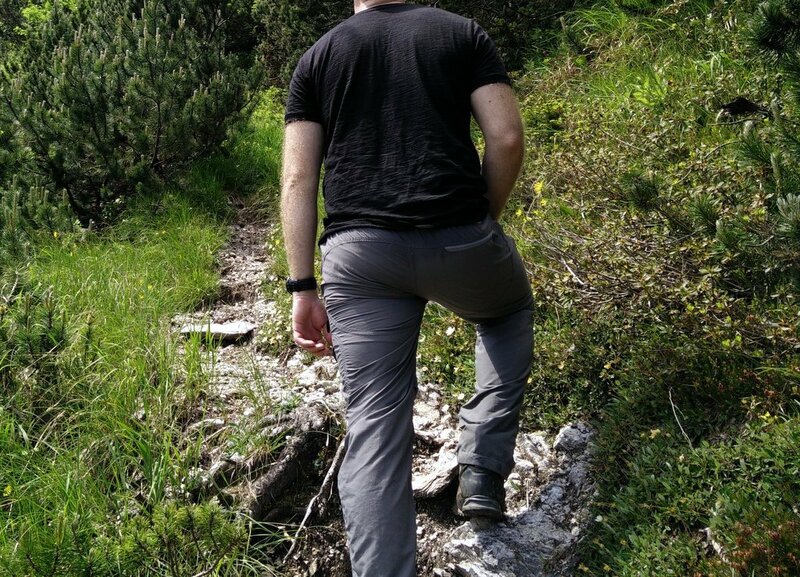 Furthermore, even after the Cima del Cacciatore hike I couldn’t detect any signs of odor. 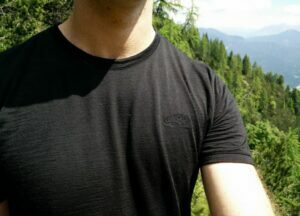 Before testing the t-shirt I was wondering whether the usually great anti-odor performance of Merino wool would be noticeably weakened by the 13 % nylon (infamous for poor odor-control) in the fabric, but after these two hikes I was assured – the provided odor-control is superb. The t-shirt feels a little less soft to the touch (maybe even slightly synthetic) than other Merino wool base layers, most likely due to the nylon fibers that are used to increase durability. It is, however, still pleasant to the touch and provides good comfort. During the testing period I didn’t notice any discomfort caused by the material. The Icebreaker Tech T Lite t-shirt is comfortable to use in various conditions. The material is quite stretchy and thus it offers great freedom of movement. Freedom of movement is additionally increased by regular fit which also enhances the performance in warm conditions (better ventilation). However, I think that the t-shirt is suitable for year-round use due to its great functionality (moisture-wicking, quick drying, breathable). In winter you might have to compensate some insulation with the mid-layer, but besides that I don’t see any reason not to use this t-shirt also in cold weather. The logo on the chest is embroidered while the label on the inner backside is printed. Therefore, there is no chaffing or other discomfort. The t-shirt doesn’t have flatlock seams, but I didn’t feel any discomfort as a result of the normal seams – indeed flatlock seams are most necessary when a base layer is tight fitting. In the neck area the seams are reinforced for better durability. 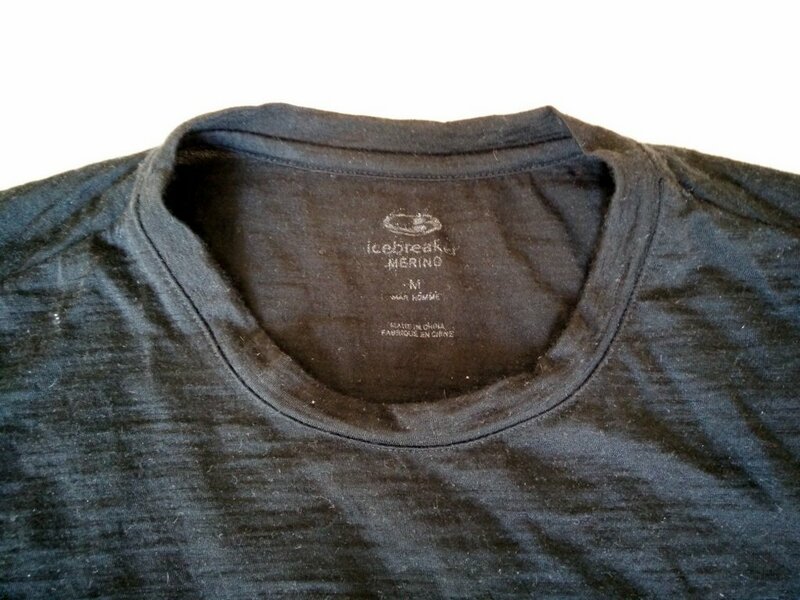 While many Merino wool garments can only be washed in cold water, the Icebreaker Tech T Lite t-shirt can be washed on 40 C in the washing machine. This is indeed a great benefit as it allows you to wash it together with other synthetic clothing that you use for hiking. 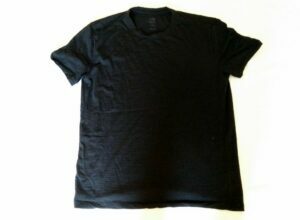 The t-shirt dries very fast due to the thin and porous fabric. 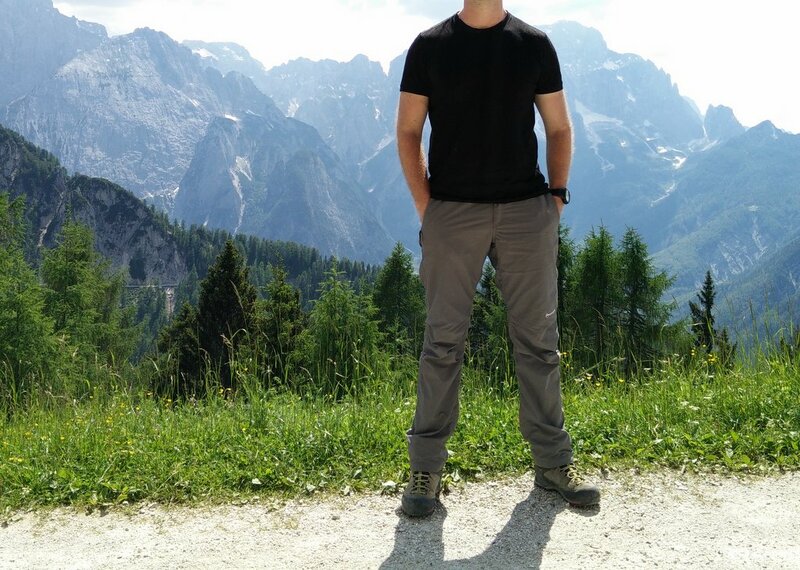 I have worn the t-shirt on my hikes in the Italian part of the Julian Alps (Jof di Miezegnot and Cima del Cacciatore trail) so far and I was really satisfied with the performance. The temperatures were quite high (+ 20 C) but the t-shirt kept me comfortable throughout the hikes. 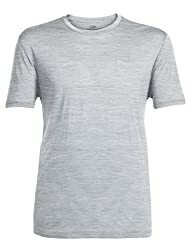 What I liked the most about the t-shirt is its great moisture-wicking properties as well as short drying time. 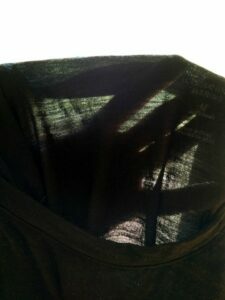 The t-shirt basically dried during every pause (up to 15 minutes) without a problem (sunny and slightly windy weather). I would recommend the Icebreaker Tech T Lite t-shirt to every hiker, mountaineer or other outdoor enthusiast who needs a well-performing base-layer for year-round use. The t-shirt might be more expensive than competitive synthetic products but it’s worth every penny. How helpful was this post? Click a star to rate it! votes so far. Average rating out of 5. We're sorry that this post was not useful! Tell us what was missing in this article? 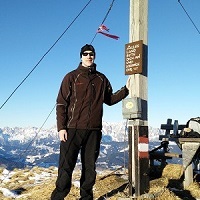 Outdoor enthusiast with experience in all types of hiking and mountaineering. Hiked in the Alps, Iceland and other countries. In love with via ferrata trails and snow-covered slopes. Check out my hikes. Fleece VS Synthetic Fill Jackets: What to choose? How to repair Merino wool clothes? Guide: How to prevent blisters when hiking? Experiment: How reliable is Suunto’s FusedTrack Feature? Be the first to know about new reviews of hiking gear and trails! *The newsletter is sent approximately once per month. You can opt-out at any time. Read more about us or check out our latest gear reviews and hikes.